Check Your Home Settings: Are You Running Out of Space ? Whether it be in our homes or on our smart phones, it seems that we are constantly vying for MORE space. Our virtual space is easier to manage by merely increasing our megabyte storage to gigabyte, or even storing data to the Cloud. Ah, thank G-d for the cloud. There’s infinite space up there. More importantly, there’s no pain and no heart wrenching decisions to make. But the reality is that we do have finite spaces in our homes. We live in an over-acquired society and without a practical exit strategy for our undesirables, we are in danger of running out of space. We fill our attics, basements, and garages with overflow, and when those spaces are maxed out, many even resort to storage units to accommodate their overabundant spillover. While purchasing storage units are certainly a vial option for specific situations, it’s not the ultimate fix. If their sole purpose is the result of decisions not made on unused items, then there will be no end to the amount of units to manage. Entering dangerous territory, for sure. More often than not, I’ve met many paying clients that have no idea what items are living in their storage facility, or have never needed to access their contents. Ever. When we consider maintaining our things within the confines of our home, there is work to be done for sure. Busy households are crowded with multiple people and activities, and must accommodate many diverse possessions. All the more reason that managing the incoming and outgoing be paramount. Failure to discard old, broken, or unused items will only result in untamable cluttered spaces. You may not realize this right away, it accumulates very slowly. Suddenly, one day you look around and are overwhelmed and not quite sure how you lost control, right? When lack of time marries procrastination, it’s a perilous combination. All the while, the unattended stuff (that rarely returns to their home) accumulates. The mounds of paper piles grow taller, and the new and preferred incoming items barricade the old. But there is a bigger picture here. The challenge is more about managing your spaces, not at all to do with the size of your home. When “busy” encounters “not today,” you can run out of room very quickly even in the largest of homes. Ultimately it’s rarely about the space at all, it’s more about the “relationship” with your things and the ability to let them go. If you’re yearning for a more serene setting in your home, consider applying these very basic principles to your thought process. It may evoke change. Without this call to action, your personal spaces will potentially remain cluttered and be at risk for overwhelming your life. Keep only the items you use and love. Identify the most active spaces in your home. Designate and discriminate what appropriate items and activities align with those spaces. Consider the zones. Create specific homes for like categories. Tame the clutter routinely. We all aspire for a Home Sweet Home setting. Making our home a place of sanctuary is very achievable. We must remember that it’s an ongoing process and requires maintenance and family cooperation. Look around. What do your spaces look like? No need for push notifications, reminders, or alerts. You will know. If it feels crowded, then it probably is. This could be the wake-up call you needed to smack you in the face. Now you’re ready to ask yourself, is it time to change your settings? Does Your Home Have a Good Flow? Do you ever feel that your house sometimes seems like one big traffic jam? Too much incoming and not enough outgoing? Is there bottle-necking in the highly congested areas? Are some hallways hard to maneuver without stepping over things? Consider this. If your house is clogged up, you can probably ease up the congestion with just a little more organization. Creating definitive zones in your home will help manage the way you and your family use your spaces. If your mail lands on a counter that is in a very active hub in your home, chances are it will be knocked over, mislaid, or even disappear. If sweaters, jackets and coats, and scarves are not put away, chances are they will get mixed in with a pile of other unattended clutter. This is a perfect storm for misplacing or losing important items. Too often, items like keys, glasses and cell phones are notoriously misplaced or buried because we put them somewhere or anywhere without a conscious effort to put them in a consistent place. And if your household is a particular hectic one with multiple activities, children, etc. the mess could get ugly. General family clutter creates chaos for everybody in the home. For adults, it could mean a missing magazine or an important bill; for the kids, it’s a missing piece to a favorite toy, board game or puzzle. Assess the damage. Time to organize. Separate the clutter, and organize specific places for each individual family member’s stuff. Too many people sharing the same spaces with little or no regard for organization can only lead to trouble. 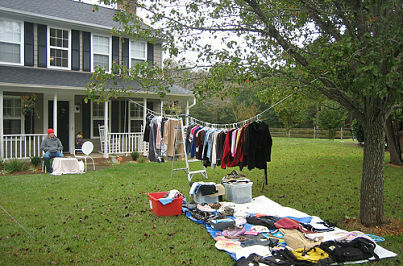 More importantly, homeless things and unattended clutter can become serious hazards for everybody living in the home. Find your busy intersection in your home and control it. Imagine a natural flow when entering your home at the end of a typical day; hanging up the jacket in the coat closet, then placing the keys in a bowl or on a hook, onto dropping the mail in a designated basket or tray, and thereafter returning your phone, glasses, briefcase or handbag back to its consistent resting place. Now you’re ready to move through your home without a trail. Pretty easy, huh? As a result, you won’t need to put anything away later, and you also know where to find them when you need them. You’ve just cut your losses, literally. If the kitchen is the most popular hub in your home, design the space so it can accommodate the heavy traffic. Be creative and make your spaces work for you. Avoid clogging the areas near the fridge with frequently used appliances. Keep counter tops clear so that more than one person can utilize an adjacent area without vying for the same spot. Encourage traffic to flow away from the crowded areas, creating more of a one-way traffic pattern into the more open spaces. If you find yourself walking in circles to look for something, maybe you should rethink its location and accessibility. A simple change can alter the flow of your home. Leave the traffic jams for the road , prevent them from invading your own home. Does your home have a good flow? Can you identify any hazard signs in your home? As the year draws to a close, it’s a natural time to reflect on the past year. There are probably a litany of projects that you had hoped to accomplish this year, but they just didn’t happen. What went wrong? Why didn’t you pursue them? Space: Many times we simply don’t have the ample space to accommodate the ongoing project to work on it. Tools: Having the appropriate materials and tools on hand to complete the project is essential. Goals/timeline: Establishing a time-line will help you achieve your goal in manageable time frames. It is so much more difficult to target ambiguous goals like “soon”, “summer”, or “whenever”. Hold yourself accountable to a more specific time, date. Create a strategic plan. Be realistic: This is a key factor for the success of the project. If you take on too much and didn’t allow enough time to complete it, you are guaranteed to set yourself up for failure. Organize: Don’t be haphazard with your efforts. Be your own Project Manager and manage it. 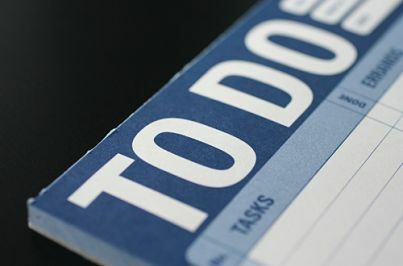 Break down the actions into small manageable bite-size tasks that you can routinely do. Commit: Staying committed to a project is probably the most difficult step of all. Focus on the goal and what it will feel like when the job is done, and create a plan how to get there. Whether it is a daily or weekend plan, carve out a sufficient amount of time to work on it. Let’s say for example your project is photo organizing. For months or even years, you’ve been shoving and cramming all your photos in shoe-boxes, drawers, or envelopes, and never made the time to organize them. This sorting process is a huge undertaking so you need to organize the process. If every time you immerse yourself into this project and it requires you to schlep the boxes up and down, to and fro, the project is doomed. Resist the temptation to spread out every photo you own and clutter every horizontal surface in your home. Organize one box at a time, so at the end of the day, you will have made some productive headway and pushed out the overwhelm. All projects (and hobbies, for that matter) need their own home. If you love knitting, corral all the yarns and needles in an organized space so that you can enjoy your hobby and not impede on the other living spaces in your home. Ditto to arts and any craft. The bottom line is this; If you DO NOT have the space, right tools, realistic time-line, organization, or commitment, you will lose interest in the project. As a result, and in the worst case scenario…you might be inclined to start a brand NEW project! Uh-oh, T-R-O-U-B-L-E. Tame your projects with time-management. Sounds like a plan to me, how ’bout you?